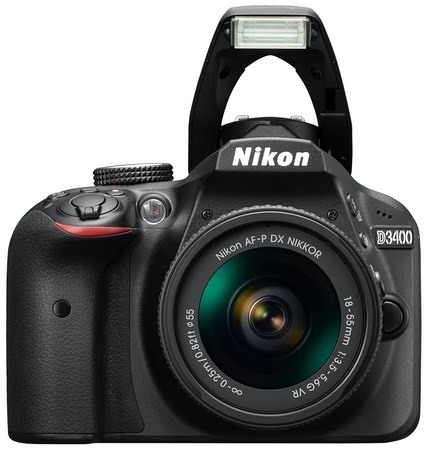 The D3400 is the latest in a long line of entry-level DSLRs that dates back to the D50. In recent times, we’ve had D3000, D3100, D3200, D3300, and now D3400. Yes, you can get it in red (or the usual black). I suppose the colored model must sell as Nikon still has this option, but it just looks odd with black buttons and dials, black leather, and of course, the standard black lenses (see photo, above). When the D3400 was announced in August 2016 a big swell of Nikon faithful complaints immediately welled: most were calling it a de-contented D3300. Why? Because of the perception—wrong or right—that the D3400 was taking features away from the previous model. In actuality, the D3300 and D3400 are remarkably similar in almost every respect. So if you haven’t read my D3300 review, you probably should read that first. Much of what I’ll say about the D3400 requires that you understand the D3300. So what about the de-contenting that was claimed? Two specific things were mentioned by most: (1) the lower GN of the built-in, pop-up flash, and (2) the removal of any sensor cleaning. The first is true. The flash is indeed now lower power, and that lower power may explain the higher CIPA battery rating that the D3400 gets over the D3300 using the same battery. The second is false. Yes, the on-demand “clean sensor now” shake system is gone. But the ability to hold the mirror up for manual sensor cleaning still remains. (Note that even NikonUSA gets this wrong on their Web site ;~). Are there any other differences? Yes, and they mostly revolve around EXPEED and SnapBridge. A tweaking of EXPEED has lifted the top ISO value by a stop to 25,600. I’ll get to it in the performance section later, but I’d also say that the D3400 is generating better looking images—both JPEG and NEF—from the same sensor as the D3300. Perhaps there’s been a minor sensor tweaking, too. But since Nikon is so opaque and cryptic on many of their sensors, especially here at the low end, I can’t really comment about whether there’s been any sensor change or not. The other EXPEED difference comes in the video. While we have the same sizes and frame rates as before (max 1080P/60), the new compression generates cleaner files in my brief experience. So you could say that the the D3300 got a thorough engine tune-up and Nikon added 100 to the name. I wouldn’t criticize you for saying that. But SnapBridge does add some wrinkles. You needed a dedicated GPS unit to get location data with the D3300. The D3400 can pull that off your smartphone (as well as date and time, though it only updates this data only once every few minutes). The D3300 required an external Wi-Fi dongle to talk to the world in any image sharing-type way. The D3400 has low energy Bluetooth built in. The D3400 is basically designed to send 2mp versions of what you shoot from the camera to your smartphone as you see fit (either everything goes over, or you can pick and choose as you shoot and review). Nikon has once again revised the GUIDE system in their entry camera, a bit more on that in the Handling section, below. We’ve got a new VR control in the menu system (for the AF-P lenses), and the entire menu system seems a bit better conformed to the current Nikon DSLR standards seen in the higher end cameras, with the exception of Movie Settings, which still sit in a single SHOOTING menu for some reason. Meanwhile, the body has somehow lost 15g (0.5 ounces), though it is identical in size to the predecessor. That’s about it. Pretty much everything else is identical between the D3300 and D3400. All the things you remember about the D3300 are mostly the same: 24mp image sensor, 5 fps maximum frame rate. 5 x 3.8 x 2.5" 4.9 x 3.8 x 3" 5 x 3.8 x 3.1" 4.9 x 3.9 x 3" 4.9 x 3.9 x 3"
Some would say that there’s just not enough different—specifications or performance-wise—to justify the US$100 list price difference while the D3300 remains in the lineup. I’d tend to agree, though note what I say about performance, below. The D3400 is made in Thailand, comes in black or red, and sells for US$650 including the 18-55m f/3.5-5.6G DX VR AF-P lens. Kits are available with a second lens, but be careful, that second lens is the non-VR version of the 70-300mm f/4.5-6.3G DX AF-P, not the VR version you’d probably want. Nikon’s Web page for the camera. Nikon’s entry consumer DSLR has long had a bit of a split personality. In one sense, it handles just like the bigger Nikon DSLRs, only with fewer external controls (no front Command Dial, fewer direct option buttons). In another sense, it can try to hand hold you through decision making, either through the Scene Exposure modes or the all-encomposing GUIDE mode. The new GUIDE mode seems inherently like the old Sony NEX dual-mode menu system. Basically it takes text menu items and make them into iconic buttons and visual presentations. In the sense that it’s a simpler parallel to the menu system that a total camera novice might make more sense of, I suppose it could be useful. But I find it ironic that Sony moved away from that approach while Nikon has now moved to it. The duplication inherent in the GUIDE mode to the Scene Exposure modes and EFFECTS modes makes me wonder why Nikon didn’t make those two things normally work the way GUIDE works and just leave GUIDE completely off. I really don’t get what GUIDE adds other than help, and that could have been added directly without having a special mode for it. Probably the biggest issue in the handling area is SnapBridge. I’ll bet most of you are going to think I’m going to pan what Nikon did here, but frankly, this is a more simplified version than the D500 received, and that actually makes it more appropriate for the audience for this camera, and ironically, better ;~). Here’s the thing: SnapBridge on the D3400 is basically set up to make 2mp versions of your 24mp JPEGs and squirt them over to your smartphone via Bluetooth. You can have the camera send everything, or you can pick and choose as you shoot (via the i button menu: Select to send to smart device choice). At least if you’re not in GUIDE mode, where this doesn’t work ;~). And I found that this worked well enough for some casual sharing. Bluetooth isn’t particularly fast with data transfer, but the speed for sending a single image over to your phone isn’t terrible, and it solves the “I want to share this photo” problem that virtually all the dedicated cameras have. Where SnapBridge becomes cumbersome is when you try to have it send everything. A shoot of 500 images failed due to the battery dying, and it took hours to get even halfway through that. Likewise, Nikon’s engineers can’t seem to solve a simple problem: what if I shoot raw? Nikon’s answer: make it the user’s problem. That’s right, if you want to share a NEF image you took via SnapBridge, you first have to go into the RETOUCH menu and use NEF (RAW) processing to create a JPEG version of it. Then and only then can you share it. Really?!?! How hard would it have been to automate that process? Obviously, the tools to create a JPEG are in the camera, but Nikon’s crack engineering team apparently doesn’t know how to invoke them in the background so that the user isn’t annoyed. This is just one of the things that makes SnapBridge feel so naive and incomplete: too many rough edges and things left undone by Nikon. Here’s another: if you turn the camera off when SnapBridge is still active for transmitting, you get a message that says: “To suspend transmission, select 'off' for 'Send while off. '” Good luck with that, novices. The actual menu choice you’re looking for is a menu buried in the Bluetooth menu ;~). Battery: On the one hand, while just shooting normally (without flash), the D3400 has very good battery life. I was able to get over 1000 shots in my first session even though the clock battery was being charged. On the other hand, if using SnapBridge, battery life is more measured in hours than shots, and how much data the camera is transferring. I’d really like to see a beefier result here, as you can’t take a 1000 shots, then leave the camera unattended to do the SnapBridge transfer: the battery will be run down quickly. In theory, when the camera battery hits 20% the SnapBridge session will shut down, preserving the last of the power. But in my experience with a couple of SnapBridge sessions, the camera was showing only one bar after a SnapBridge shutdown, and very quickly showed empty if I tried to resume shooting. It’s a little difficult for me to assess just how this performance might be interpreted by the likely purchasers of the camera. I doubt that they’ll stress the shooting levels as high as I did, and if they’re not, then it’s quite possible that the D3400 is an all-day shoot-and-share camera for them. 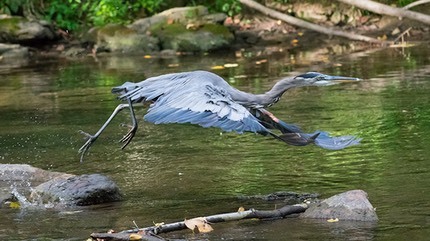 For me, the very first session I shot was of Frank, my local heron, and Frank was very active so I shot like I do with all wildlife: quite a few shots. Probably at least 500 of just Frank before I moved on to shoot other things. Likewise, when I’m testing cameras, I’m shooting to battery exhaustion most of the time, so obviously the shoot-and-share thing doesn’t work at this level. If you’re a prodigious shooter as I was, you’re going to want to turn Send to Smart Device (Auto) off, then use the i button to send selected photos to share via SnapBridge. Buffer: The buffer is 100 shots if all you ever do is shoot JPEG (at least with a decent UHS-I card). But the raw buffer is only 17 images with the buffer-chewing controls turned off (e.g. Auto Distortion Control). Add a JPEG to that raw file, though, and the buffer sinks to 6 images. There are nine shots in this sequence (at 5 fps). I’m showing you #2 and #7. All but #5 were in focus, and considering I was using an off-center focus sensor here (I anticipated Frank taking off) I found that pretty exceptional for a low end camera. The one shot that’s out of focus went to the background because Frank’s neck did a deep U just about where the focus sensor was and I missed getting any part of it on the bird. But the interesting thing to me was that the D3400 and 70-300mm f/4.5-6.3G AF-P combo could flip so quickly from bird to background and back to bird. It only missed one shot in a 5 fps burst. One thing that was very surprising was the Live View autofocus speed. At least with the two AF-P lenses, the D3400 has far faster Live View autofocus than any previous Nikon DSLR. It also seems to work better in low light than before. This is one of the reasons why I think Nikon is experimenting with AF-P: DSLRs benefited from lens motors that were able to make large jumps quickly but didn’t need to make very small changes of focus position in real time. Even a 12 fps DSLR doesn’t need the lens to move particularly fast in small incremental tracking. But Live View (and mirrorless) does require not only fast large moves by the lens focus system, but also fast incremental adjustments (essentially a minimum of 30 fps, but generally 60 fps these days; even faster than that to demote implied shutter lag as an issue in Live View while tracking subjects). The D3400 and AF-P lenses seems to be the first big change to how Nikon is handling Live View (and thus video) focus, and the difference is dramatic. Putting an older 18-55mm AF-S lens on the same camera resulted in far more sluggish focus tracking. One can only guess that whatever Nikon is playing with in the D3400 Live View coupled with AF-P lenses has to foreshadow what they’d do with a mirrorless system. If so, good on them, as this is the first time I’ve seen Nikon make any progress on contrast detect focus speeds. In terms of dynamic range and low light use, I don’t see anything major that’s changed compared to the D3300. Yes, the noise reduction at high ISO values for JPEGs seems a little bit more refined, and I found that I could press up into ISO 6400 without a lot of worry. Raw files, however, seem very much the same. If you need more information, see my D3300 and D5500 reviews, because the output is very, very similar. As a dirt simple, basic, crop sensor DSLR, the Nikon D3400 is arguably the best of what’s out there. Except for maybe the D3300 ;~). Image quality is excellent for its class, and exceeds what I’ve gotten out of the Canon Rebels in low light. I just can’t complain about image quality, at all. From the D3400 up through the D500, Nikon’s DX lineup now has remarkably good out-of-camera images, and produces raw files that can be pushed in all kinds of ways. But this is a budget DSLR, so something has to give. In particular, you get (a) a focus system with few and mostly central positions, and with only a single cross sensor; (b) fewer external controls (no Front Command dial, few added buttons); (c) a pentamirror viewfinder that’s not 100% view and slightly more towards the tunnel effect than the bigger cameras. And yet the focus system is fast with the right lenses (e.g. AF-P), the camera does very credible HD video, and there’s just enough controls and customization to get you by. The viewfinder isn’t my favorite, but it’s not particularly bad, I just have to remember I’m not seeing a 100% view and frame slightly tighter accordingly. On balance, the D3400 is a fine camera. I think Nikon could have softened some of the rough edges more, but it acts like, shoots like, and performs like a modern Nikon DSLR. The new AF-P lens that comes with the camera—you can only buy a camera kit here in the US—is also pretty darned good for the price point. Better than the previous 18-55mm lenses Nikon has produced in almost every way. Thus, if you’re in the market for a low-cost DSLR that has a lot of good performance to it, the D3400 may be your choice. I can’t really say anything bad about it, especially given it’s price point. To all those that were upset about the de-contenting of the D3300 to produce the D3400, I’d say this: relax. Yes, Nikon is cost cutting here, but they haven’t damaged anything particularly major. Unfortunately, that also means that the D3300’s that are still available new on the market are an even better bargain than the D3400. Nikon just didn’t move the bar much between the two models. If fact, some bars moved one way, some the other, and the net effect all washes out. 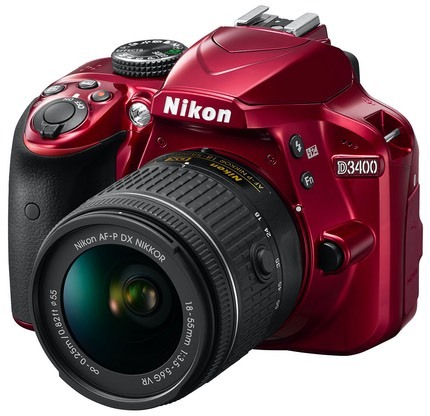 That said, you have to consider the D5500, which is US$100 more. For that extra money you get a slightly less rough-at-the-edges camera with a fully positionable touchscreen LCD, a flash with more power, 14-bit raw, exposure bracketing, and a better autofocus system that extends over more of the frame.